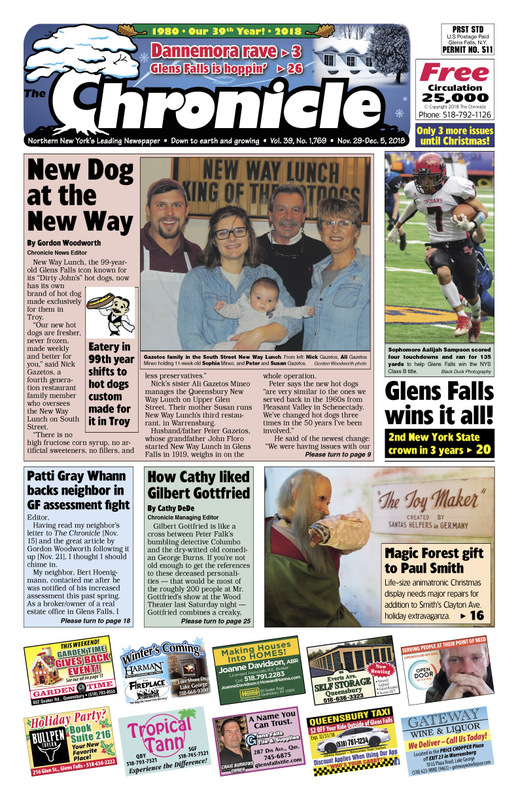 Home for the Holidays issue | New Hot Dogs at New Way Lunch. Glens Falls Football wins it all! Cathy’s take on Gilbert Gottfried. Magic Forest gift to Paul Smith. Gordon: Escape At Dannemora is riveting TV. Jimmer: I’m gunning for return to NBA; ‘this time I’ll succeed’. More Glens Falls property tax debate. So many holiday events! Pages of real estate listings… Find your dream home! Concerts, comedy, shows… The Chronicle always has the region’s best Arts & Entertainment section! Next: Glens Falls wins it all!